This article is written by HiveMindEmulator, originally posted on the forum. The fact that it’s a 1) village, 2) a source of +buy, and 3) reduces/alleviates the need for trashing means it nearly enables engine strategies all on its own. The only thing it needs is a means of increasing handsize (and some way of making . You have to be careful with terminals that give only +2 cards (e.g., Moat), since if you have to discard for +action and then only draw 2 cards, you still only have 5 cards in your hand. This can be okay if you’re trying to sift/cycle to play cantrip money or repeatedly cycle to find a key card, but a lot of the time you’ll find that you’re just spinning your wheels and would be better of just skipping the Hamlets and going more for money (or a non-handsize-decreasing village if possible). But terminals giving more than 2 cards (Smithy, Council Room, Torturer, Nobles, Rabble, Margrave, Catacombs, Hunting Grounds, Envoy, Wharf) are great. Draw-to-X cards (Library, Watchtower, Jack, even Minion) are even better, since they negate the downside of discarding, and can benefit from it (discard bad cards with Hamlet to draw hopefully better ones). With non-terminal handsize increasers (Laboratory, Shanty Town, Apprentice, Apothecary, Scrying Pool, Alchemist, Menagerie, Hunting Party, Stables, Governor), you can use less of the +actions discard, just using as many as needed to play your terminals or to help activate the draw of Menagerie or Shanty Town. Hamlet even works nicely with the oddball handsize-increaser, Counting House — discard Coppers just to scoop them back up, and use the +buy to get more! While the presence of Hamlet makes it quite likely that it will be an engine game, it is not necessarily the case that Hamlet will be the best village for the engine. Very often, you will prefer to purchase a more expensive village if you have the money for it, sticking with a couple Hamlets to add in the non-terminal +buy. Because of the discard, Hamlets are generally inferior to other villages when used strictly as a village, with the primary exceptions being when the discard is beneficial. This problem becomes even worse with the case of the aforementioned +2 card terminals, and also with handsize attacks. If you start with only 3 cards, it’s very hard to have stuff you want to discard. Every card is precious. But even when you’re not using Hamlet as a village, it can be very beneficial as a +buy or even a very easily amassed cantrip. For example, with Scrying Pool, you just want as many cantrips as possible, so you can draw them up, and then play them to substitute in other cards. And for Vineyards or Gardens or Philosopher’s Stone, the more (action) cards in your deck, the better. And you can even use the buys on Coppers to get even more cards into the deck! In order to do anything useful, Hamlet must decrease your handsize. This makes it much more painful to use when your hand already starts small. Additionally, having excess Hamlets to use as cantrips can cause decision problems with your discard. Since you don’t know what the Hamlets will draw, you have to make hard decisions between discarding Hamlets and other cards. Since it only costs $2, you will likely have to “overpay” for your first Hamlet. But you usually want to get it early so that you can use the buy to tack extra Hamlets onto your other purchases or to purchase multiple Hamlets at once. Since it’s so easy to quickly collect a bunch of Hamlets in a small number of turns, you have to be careful not to get caught with too few Hamlets when the pile runs out. If the Hamlets are the only villages and are so far split 3-3, then your opponent buys the remaining 4 in one turn, you can find yourself on the wrong side of a 7-3 split. This gets even worse with more players as the number of Hamlets that can disappear between your turns increases further. So there is some need to get your Hamlets in early. But on the flip side, you can end up with a “village idiot” deck if you just focus on grabbing Hamlets at the expense of overall economy and draw. So there’s a delicate balance here, particularly when you’re not first player. Naturally, this makes Hamlet a first-player-advantage card. 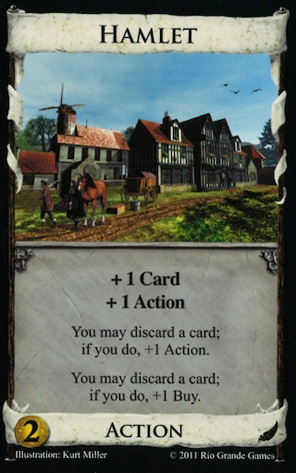 When you play Hamlet, you have a couple decisions to make, so you generally want to play them as late as possible so you know if you need the extra actions of buy, but this is often not possible, since you may have to use it as a village right away in order to play your terminal draw card. You have to have a reasonable sense of whether or not you might need the extra buy and if you’ll have another Hamlet play later to get it. Also, if you have a lot of Hamlets in hand, you may want to use more for +actions, even if it means discarding a Hamlet, since there is an increased likelihood that your terminals are also clumped, and you’ll need to have the actions available when you draw a bunch together. If you waste all the Hamlets as cantrips, you may run out of actions. This entry was posted in Cornucopia and tagged hamlet. Bookmark the permalink. This was such an obvious one, I’m surprised the article didn’t mention it. If you TR or KC a Hamlet, you get the “branch actions” without having to discard cards, which is nice to leave the discards for just getting +Buys. A very elegant synergy I saw used once is with Peddler: simply buy nothing but Hamlets (or maybe a stray Peddler if possible) until you can play four in one turn, discard all your cards for plus buys, and buy 5 Peddlers for $0. I’d be curious though how good the percentages on playing for that would be. Of course with good trashing I assume it would be sensational. Worker’s Village/Peddler is a classic Prosperity combo, and Hamlet/Peddler plays almost identically but is quicker to set up. Market Square/Peddler ought to be quite good too, come to think of it. Trashing can certainly help turn it into a powerhouse but you don’t even need “good trashing” as you suggested. These decks cycle so quickly that even weak/slow trashers will soon thin them out very effectively. Many TfB cards like Bishop and Remodel have their own synergy with Peddler as well. Alternatively, you have Actions to spare here: tossing in a couple Smithy-types will easily let you draw past all your Copper. Even the Cellar family can get the job done; its handsize reduction combined with Hamlet’s can cause problems, but in some games you don’t really need to discard for Hamlet once you’re done buying Peddlers. Along similar lines, Hamlet/Conspirator works pretty well. I know I’ve made this mistake many times with peddler: it is a weak strategy on its own. Make sure there’s some other reason to go engine (or some way to really use the peddler e.g. bishop/etc) before committing to this. unnecessarily triggering reshuffles should be mentioned as well. if you have a deck that can draw itself using hamlet as the village, then often times you end up with most of your junk in the discard pile (in order to get the +actions). then, if you play your last smithy (or any card-drawer) and cause a reshuffle, not only will you pick up junk, but your next turn (or two) will be junk as well. Won’t this synergise greatly with gardens? You can easily buy a lot of copper with them. Even better if there is a workshop, they’re much less likely to collide. Anybody tried this? if workshop and gardens are both present, then my experience indicates that you should prioritize both over hamlet. And later, you’ll prefer estates, so hamlet is something you’re very happy to buy on the odd $2 hand early in the game. Occasionally, Hamlet is actually most valuable for its discard ability. There’s the obvious Tunnel combo that Mustang255 mentioned, and my personal favorite, possible only under highly specific circumstances: using it to “top-deck” a card for Native Village when your deck is empty. For example: play Hamlet, discard a Province for either the action or the buy (you won’t use either), play Native Village to set the Province aside (you had no cards in your draw or discard pile), play two Poor Houses to achieve $8, buy a Province, repeat again next turn. There are several variations on that, but I believe that’s the only one which uses just $2-or-less cards (except for the Province). Of course, it would probably take too long in a real game to be successful, but it’s just plain fun. with strong trashing, I don’t think this would be too hard to pull off. neat! can you play 3 hamlets in a row then play a draw four card and then use those four cards as discards to activate the extra buys and extra actions on the hamlets or do you have to discard and choose extra actions and extra buys as you play the hamlets? The latter. Generally any action has to be resolved in its entirety before you play another one.